Many people don’t think about saving for retirement until the day they realize it is inevitable. Many retire voluntarily while others are forced to retire involuntarily. Whatever the situation may be, it’s good to understand the big picture for retirement so that one can plan for it. There are typically four life stages one has to consider when creating a strategy for saving for retirement. According to recent studies, 78 million Americans hold the majority of the over 26 trillion dollars in retirement plan assets. How much tax will I have to pay on these retirement plan assets when I take a distribution? Can I use my retirement dollars for education? Can I use my retirement plans for health expenses? What if I become disabled and can no longer work? What happens to my plan after the event of my death? Having these types of questions answered will bring clarity to the options available to retirement savers as they personally develop a strategy to tackle these inevitable factors. Planning ahead is big a part of that strategy and developing a plan ahead of time can make a difference in the outcome. Understanding the issues in each phase can help with creating answers while helping transition to the next phase. 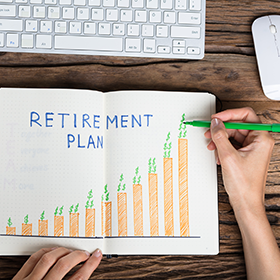 Since the passage of the Employee Retirement Income Security Act of 1974, retirement plans have been one of the three retirement savings buckets Americans have seeded into as an eventual source of income for retirement. Employer-sponsored plans and Individual Retirement Accounts (IRAs) have been the two types of retirement plans used to accumulate wealth on a tax deferred basis. Many have contributed to these plans through their employer on a payroll deduction arrangement. Others have made contributions to IRAs or a combination of both. The investments in these plans have either done very well through the years, while others have experienced the roller coaster of the highs and lows of the stock market (which is where the majority of the retirement plan balances are invested in). Without such an event, they do not have access to their retirement savings and are limited to investing within the plan’s investment offerings. Individuals who are closer to retirement may change their investing philosophy and choose more conservative investments within these plans to preserve the gains they have made throughout the years. This preservation stage is where millions of Americans have been, due to the volatility in the stock market. Although the accumulation phase and the preservation phase are important, the distribution phase is the most significant phase. This phase identifies goals and defines the strategy to meet the goals. Finally determining which type of retirement plan to contribute to should be determined based on the ultimate goal. Is the goal to reduce taxation? Or transfer wealth to the next generation? Maybe it’s to simply create a stream of income during retirement? It’s important to determine the strategy and goal(s). As an example, Roth contributions although taxable, will produce an eventual tax-free distribution of earnings (if certain conditions are met). This will not only reduce taxation during retirement, but the tax benefits are also passed on to the named heirs. Traditional IRAs on the other hand may reduce the IRA holder’s taxable income for the year of contribution. Although distributions from the account will be taxable to the beneficiaries after the death, if taxation is not an issue, the Traditional IRA may be the solution. Nonetheless there are many factors to consider in planning for retirement and knowing such factors will help in making the right decisions. Balances in IRAs left in the account upon death transfers the ownership to the beneficiaries. The IRA rules provide options for the beneficiary on how they would like to deplete the account. Since assets in the Traditional IRAs have never been taxed before, it is essential for the beneficiaries to know their options to avoid potentially distributing more assets than they need to and prematurely depleting the IRA. For Roth IRAs, although distributions may be tax-free, knowing the options may help prolong the tax-deferred growth of the balance under the Roth while taking only incremental tax-free distributions. Other issues such as death of a beneficiary, capturing non-deductible balances, Federal Transfer Tax and rolling over employer plan beneficiary accounts to inherited IRAs may come into play. Financial professionals have a large role to play in educating and assisting Baby Boomers who are ready for this phase of their life and want to know more about the financial implications of transitioning from work to retirement. This is assistance that few financial institutions or employers offer. Professionals like CPAs, CFPs, Financial Advisors, banking personnel, brokerage firm representatives and other professionals need to stay educated to help their clients with questions they may have along all these retirement phases. IRA Academy provides professionals with educational classes on IRAs and IRA-based employer-sponsored plans. This event is open to anyone who wants to stay competitive in the retirement field. To receive more information about the 2019 IRA Academy, or to take advantage of our early-bird pricing for our event, please visit our site. You’ll be among the first to know about the agenda, curriculum, and registration details.